Here at Personal canvas prints we specialize in turning your beautiful photos into artwork. We are an experienced canvas printing business that has been running for 9 years and we have thousands of happy customers. Printing photos on to canvas is our main passion and we enjoy every moment of it. If you have a photo that you would like printed as a canvas print then we are the right choice for you. 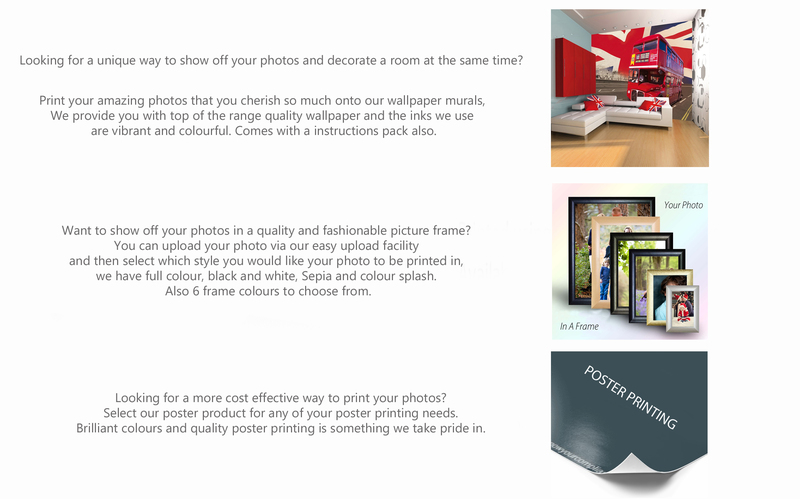 From order confirmation through to you hanging your canvas photos on your wall. The whole process is a fun yet creative subject. Our decoration is changing and how we design and make our homes looking is an art form in its self. By using canvas prints for your artwork or your photography you are 100% sure to adding a touch of elegance along with a stunning visual effect. Photo canvas prints are such a great way to decorate any home or office area, especially if you’re looking to add to your home and give it a boost by adding colour and artistry. If you do have any questions or having any photos that you would like a second opinion on if your unsure of an effect you would like implemented to your photo then feel free to email us at production@personalcanvasprints.co.uk and we would be more than happy to help. You take the photo. We create the artwork for you. It’s that easy. As we pride our self on quality and customer service it’s our aim to provide the best canvas print possible for your walls. Our canvas prints are made form the best materials found in this trade. We use the best suppliers and combine brilliant workmanship to create the best canvas printing work of art possible. Our frames are made of 100% pine wood and they are manufactured in a specific way to suite this type of wall decoration. The name for this type of frame is called a stretcher bar frame. We also only you 100% quality inkjet canvas white is represents perfect conditions to get the maximum colour and brightness for your canvas print. All of our canvas pictures are made with world leading printers and we only use top brands like canon, Epson and hp. Our large format printers use original high quality pigment ink that is vivid and also UV resistant. Making sure your canvas print has 75 years fade warrantee is also one of our main objectives so that you can enjoy your work of art for years to come. Brining your memories to life in and around your home with a canvas print. Taking photos is such a big part of all our lives as we want to try and capture the best times that we experience. There is plenty of ways to have your photos printed but the canvas printing method has to be one of the best as it not only offers a stylish and modern take on your photos it also give a touch of art and personality to. One great thing about printing photos and artwork on to canvas, especially if you’re an artist or a photographer is that you can use this way of printing for your own customers and offer a great service when it comes to giving people options on how they can display their photos of their loved ones and family. What we offer with canvas printing and all the materials used in the process.
. We offer trade canvas printing for all traders that are looking for top quality prints at the best prices. So if you’re an artist or a photographer, or even a designer or a start up business. Email us for details about trade prices and we will be happy to help.
. Top quality photo canvas prints are our only mission. You will always get a 100% guarantee with us when it comes to the right materials for the job.
. 75 years fade warrantee is standard with our canvas prints.
. We offer different effects with your canvas pictures. For example we can turn your photo into black and white, or sepia and we will do this for free to.
. We have an easy ordering process through our website. Simply select your effect, your canvas print size and then upload your photo.
. Gallery style deep frames are also an option with our canvas printing service.
. Fast and reliable delivery service. We use royal mail and parcel force for all of our deliveries. We package your canvas artwork perfectly ensuring that your canvas prints arrive in lovely condition ready for you’re to hang on your walls. New Gallery style frames add an even better wow factor to your home when it comes to stunning looking canvas photos. Taking photos and printing them as canvas prints is such a great way to show cases your photos in your own home. We have standard 18mm deep frames for your canvas photo prints and they really do look amazing with this type of frame. If you’re looking for an even more desirable look with your canvas artwork then choosing our new gallery style 38mm deep frames may by the choice for you. The gallery style frames offers more of a three dimensional look to your wall decoration bringing your photos to life even more then they original are when you transform your photos in to a canvas print. Personal canvas prints is all about give the best photo transformation possible. We as a team love to hear about your photo printing needs and will always try our best to collaborate with you to create the masterpiece your desire for your walls. Taking a photo and making it into artwork is our speciality and we only produce pristine pictures with every canvas print finish. From the canvas print its self to the staples that we use for the back of your artwork, you will always get top quality with us.